Crime-themed online slots come around fairly regularly and within that genre there are also one or two mafia-related slots such as Dogfather and The Sopranos; Random Logic has added Mafia Madness to that list and at first glance it’s a great-looking game with some really high-quality graphics. 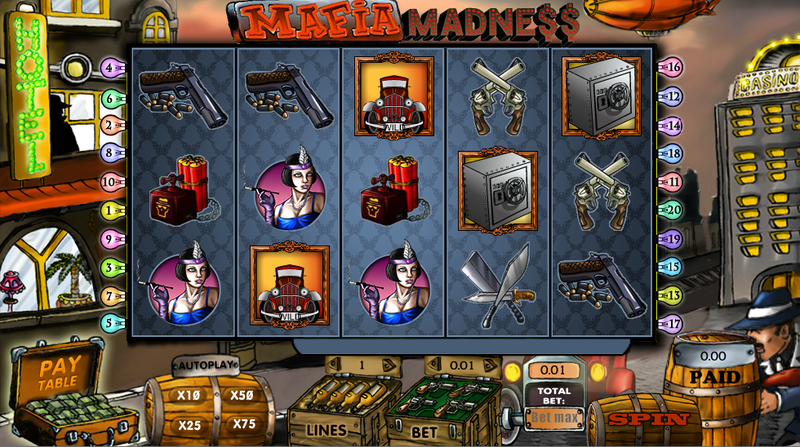 Mafia Madness plays out over five reels and twenty paylines and the backdrop to the reels is a neon-lit city view with hotels and casinos displayed in an attractive cartoon style. Below the reels the bet amount, the number of lines and various other information are built into casks of alcohol, boxes of ammunition and suitcases full of cash. All the symbols are theme-related and include knives, revolvers, pistols, explosives and automatic weapons; more valuable are the characters in this narrative such as the attractive ladies, the enforcers and someone who looks like a Godfather. Bonus symbols include a safe which triggers the main feature, a classic gangster scatter and a vintage car wild (it’s vintage now of course – it wasn’t back in the 1903s). There’s just the one bonus game included in Mafia Madness but you may be relieved to hear that it’s not just another free spins round. To trigger it you’ll need to land three or more of the safe symbols on an active payline and then you’ll get to take part in your very own bank heist. Your task is to click as many of the bags of cash shown as you can before the police arrive to spoil your criminal fun. If you can trigger this feature with five safes, all prizes won will be multiplied by 25x. The feature is triggered by symbols on an active payline which means you’ll have more chance of activating it the more paylines you’re playing with. There are twenty available so play them all if you can. This game looks great and plays extremely smoothly; it has a pretty creative bonus feature and a laid-back soundtrack to accompany your gameplay – well worth a go but try and ignore the low RTP of 91.69%.